Driving sales is such a vital component of every company’s strategy, so it may seem illogical to even consider outsourcing any part of your sales process. While outsourcing the right elements of your sales strategy can be a powerful way to give your company the boost that it needs, building an in-house SDR team and scaling it can exponentially benefit your company in the long run. In this article, I’ll talk about the pros and cons of complete outsourcing, outsourcing certain functions of the SDR role, and building your entire SDR team in-house. At the end of the day, all of these options produce results. It’s up to you to determine what fits your company best. The reason SDR outsourcing is becoming more and more popular is because companies are beginning to realize that they can get similar or better results for a fraction of the price of creating their own internal team. 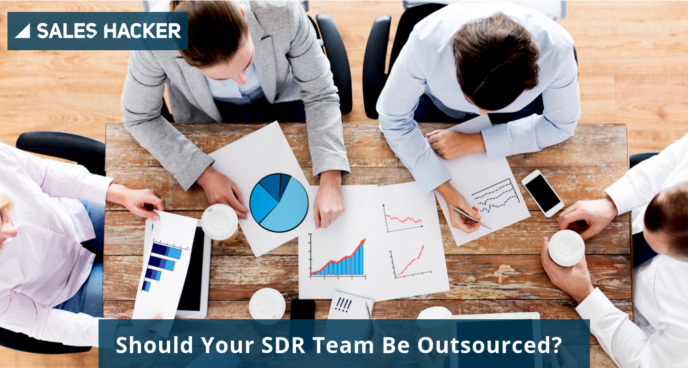 If you’re just beginning to build your SDR team, outsourcing might be a great option to start. “According to most surveys, cost savings is the primary reason for outsourcing. Interesting data from leading job sites likeGlassdoor,Indeed, andAngelListsuggest the average SDRbase salaryranges from $47.8 to $62K” (Hubspot). Keep in mind that this number does not factor in the cost of hiring, training, software, hardware or other typical overhead. Something else to consider is the fact that the SDR position is often viewed as a short-term launchpad to a career in sales, meaning that SDR turnover can be quite high for internal reps.
Perhaps the costliest and most time-consuming part of the entire process is forming a quality team. The amount of time it takes to launch a professional sales development program is drastically reduced if the function is outsourced to a firm that already specializes in prospecting. This route can prove to be much more efficient and can even take the launch time from months to weeks because outsourced firms have people ready to start making calls immediately. Many companies that begin building their SDR programs internally quickly realize that it is much more difficult to manage than anticipated.Other than having a team ready to begin making calls at any instant, outsourcing also reduces the cost of mistakes. When you outsource your SDR team to a specialized firm, mistakes can be easily fixed as opposed to an internal program where mistakes could have a long-lasting impact on your bottom line. Outsourced SDR teams are much more flexible and quick to adapt to changes, removing the burden of recruiting, hiring and managing an internal team. This is because outsourced teams know the ins and outs of the business. They’ve seen it all and are able to adapt to changes with minimal effort and little to no time delays, while an internal SDR team might struggle to adjust due to their lack of experience. Add that to the fact that most SDRs spend around three hours a day on research itself, just imagine the amount of deals your sales team could be closing within that time frame.The reality is that your salespeople will not consistently prospect. Your team should be focused on their job of using their skills to close more deals while letting someone else handle the “dirty work”. In order to watch your revenue grow, your company should outsource prospecting to a qualified agency that is specifically created to make phone calls that lead to real sales appointments and more clients. Finding the right outsourcing partner for your business is no easy feat. By taking the time to do your research and selecting the best partner for your organization, you’ll be rewarded with a strong team that provides a strategic option for scale while your internal sales team focuses on closing deals. This hybrid approach involves the company hiring in-house SDRs that focus on qualifying leads, engaging with accounts and filling pipelines while also working on special projects. In this situation, the outsourced reps work alongside the in-house team and perform a similar set of engagement and lead-qualification activities. This blended approach allows your company to use the outsourced SDR team as a resource that is always on and available at any time, prepared to ramp up quickly and then scale down when needed. This method can be useful in situations where hiring and training an internal SDR team would be too time-consuming or costly. The combination of flexibility, reliability and experience from the two teams makes this approach beneficial for many B2B companies. The initial costs of bringing an SDR team in-house can be quite high, costing even more than having your team outsourced. However, after the initial setup, internal SDR teams become more cost-effective over time. The SDR function is the face of the company, so keeping it close to the chest makes sense. After all, first impressions matter, and the thought is that by keeping your SDR team in-house will make your brand image easier to control. Keeping this forward-facing entity in-house eases a lot of worries, particularly around the security of critical information involved in the process. SDRs have access to a lot of valuable information including client details, pipeline information and client notes that your company would probably want to maintain control over. “Understandably, when it comes to sales, control is a top reason for not outsourcing. SDRs are people who contact your potential clients directly. You don’t want them to screw it up” (Hubspot). Letting eminent information fall into the wrong hands could potentially damage your reputation. Ideally, once more than two SDRs are on board, a manager is a must. Someone who is specifically dedicated to leading, managing and motivating your Sales Development reps. SDR managers set a positive and upbeat culture for the team and reward high performers with perks and new opportunities. Having a good manager is vital to ensuring that your SDR team’s needs are being met and that they are working to their fullest potential. In addition to a manager, every successful SDR team requires the proper resources. There are several key technologies that can assist in setting your team up for success including: a proper CRM, sales automation technology and other sales intelligence tools that aid in finding contact and company information. Once you have all of the tools in place, you can begin to scale your team! It’s important to keep in mind that scaling a team takes time. Many managers are tempted to scale too fast, but if they focus on doing this gradually, over time your company will have a highly productive SDR team bringing in qualified leads and closing more deals. With the evolution of technology, it can be difficult to tell whether or not the SDR on the other end of an email is a real person or a robot. While automating the SDR process companies could be saving both money and time, people want to do business with people, and not have a machine “closing the deal”. Humans have the ability to be authentic and genuine, traits that can never be entirely automated, and the automation process cannot engage or move the sales process forward the same way a person can. At the same time though, automated prospecting can save time for your SDR team and improve lead quantity while helping your reps prioritize where they should invest their research and calls. Determining which tasks are smart to automate and which should be done by a person is a very important factor to consider. There is no one-size-fits-all solution, so this decision should be made on a case-by-case basis. Choosing the right balance depends on several criteria, including the market size, the complexity of the deal, and the importance of the individual prospect. When you are working with a very large market, you don’t need to be super specific with your SDR process. However, if your market is very limited, you’ll want your messaging to be more direct. For complex purchases, you’ll want to build stronger relationships with the client, which means personalized outreach can help you establish a more solid connection. Regarding individual prospects, if there is a client you’re really after, then you need to do whatever you can to get them. In this case, you’ll want highly personalized communication. Regardless of your SDR choice planning and execution are your keys to success. Remember, growth is good, so embrace this challenge and enjoy the ride.